A party political broadcast on behalf of the Rory Leave McIlroy Alone party will follow shortly, but first a Christmas tale from the studios of LMFM radio in Drogheda. A little over a year ago, at a time when like so many of my fellow Irishmen and women I was between jobs, I did some work with the good people at LMFM. For two weeks over the Christmas holidays I was their mid-morning talk show host and, believe it or not, some people actually listened. That, I suspect, was mostly down to the guests as the likes of Niall O’Dowd of this parish dropped back home to talk about life in the fast lane of publishing in Manhattan and other more trivial matters, like Joe Sheridan’s goal for Meath against his beloved Louth in a certain Leinster football final. Tommy Smyth of ESPN fame, another Louth man, and his lovely wife dropped in another morning to talk football and emigration and 9/11. We had the great Brush Shiels singing “Fairytale of New York” to us down the phone line. Paddy Goodwin, a local solicitor who prefers to play guitar, and Ireland’s biggest Birmingham City fan Darren Hughes talked Christmas music with Ken “Glam” Murray of Spiders nightclub fame. Dave Fanning and the wonderful comic actor Joe Rooney spoke of their favorite Christmas movies. And a great man by the name of Shane McEntee came into studio for our review of the sporting year that was 2011 when he shared the chair with Paddy Carr, well known to local GAA fans in these parts, and the very witty Meath footballer Cian Ward. Now Shane is a man I had known a long time, so he was comfortable company that morning. As a young reporter, years ago now, I had watched him playing football for Nobber although never as well as his brothers Gerry or Andy. In my time, I had seen him coach and manage various underage and senior teams in Meath, mostly with some success. And I had always witnessed his passion for the GAA in general and Meath in particular, so I asked him that day if he really did ask the stewards to lock the gates and “make them watch” when the Kerry fans started to leave Croke Park early as Sean Boylan’s charges hammered their football heroes in the 2001 All-Ireland semifinal. Shane would only grin and laugh when that question was put to him that day, a grin and a laugh so wide and powerful that I can still see it clearly, even now when so many are still crying for the same Shane McEntee. A year down the road from that day, I was back in the LMFM studio last week to again review the sporting year, 2012 this time. This time I had a friend to remember, a man by the name of Shane McEntee who took his own life in such tragic circumstances and was buried on Christmas Eve when the rest of the country was preparing to celebrate. It was hard to believe that the man who had grinned so happily a year earlier was being laid to rest that day as we stood in our thousands on the main street of his native Nobber. His brother Gerry, the toughest of a tough bunch of Meath footballers in their day, told it as it was from the pulpit in the family’s parish church as he poured scorn on those who had chosen to abuse Shane, publicly and online, for his role as a member of the governing party that is Fine Gael. Gerry told those who had belittled and besieged his brother, those whom the family believe helped push him towards the crudest and cruelest deed of all, to be ashamed of themselves. At a time when Ireland is openly and rightly debating the excesses of the Internet age and the cyber bullying that cost two Donegal sisters their lives, also by suicide, it was sobering and heartbreaking to see the ramifications so close to home. I felt for Shane McEntee and for his family, both on the Friday before Christmas in Nobber and on the Wednesday after the festivities in the LMFM Studios in Drogheda. And that’s where Rory McIlroy enters the equation. No debate about the sporting year of 2012 could fail to mark McIlroy as one of the stars alongside the Donegal footballers and Jim McGuinness and Katie Taylor and Jason Smyth. Nobody in their right mind could question any decision to honor McIlroy for his feats on the golf course in the season that ended in the middle of December. That’s why we saluted him in Drogheda that day, our host Deirdre Hurley and Sean Kelly from the Meath management team and Liam Harbison from Paralympics Ireland. We also discussed Rory’s Olympic Games predicament and whether or not he should represent Britain or Ireland when golf returns to that stage in Brazil three summers from now. There are those who believe Rory should play under the green, white and orange flag in Rio, as golf in Ireland is a 32 county sport which paid for Rory’s coaching. Then there are those, some of whom are currently rioting in Belfast, who believe that Ulster is British and British only would probably burn Rory at the stake if he went green in 2016. Put simply – Rory can’t win. Which is why I suggested on the LMFM program that he should simply skip the Olympics altogether and not align himself to either side. 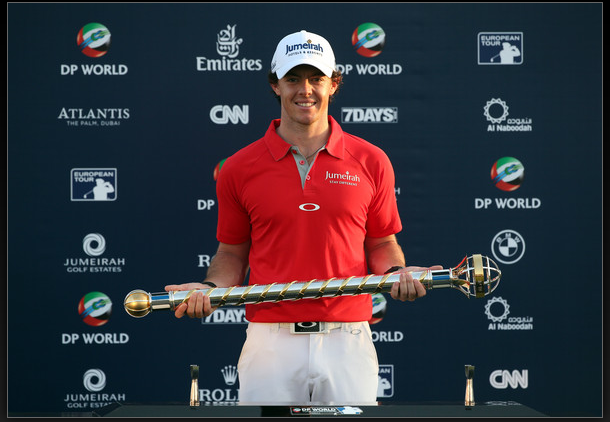 Little did I know that just last week, Rory would make the very same prediction to BBC television when he suggested that he has three Olympic choices – Ireland, Britain or withdrawal – and may well choose not to play at all in Brazil. Guess what? After watching the pain the McEntee family went through in these last few weeks, I am happy for Rory to do whatever he wants to do. Life really is too short to worry about a flag or a game of golf, and I say that as a man who loves his game of golf. So if Rory is British, Irish or absent in Rio for the next Olympic games I will wish him well. And ask others to do the same. GAA: A great start to the year for Ireland’s biggest sporting organization on Sunday was highlighted by the presence of Cavan’s Maggie Farrelly as a lineswoman, so to speak, for the McKenna Cup clash in Omagh. Maggie made history as the first female to act as a sideline official for an inter-county match and has been feted in every national media outlet since the game. She says she wants to referee in Croke Park some day soon and I hope she does. RUGBY: It’s make or break weekend for Leinster and Munster in the Heineken Cup, but I wouldn’t be holding your breath. They both need big wins, against the Scarlets and Glasgow respectively, to stay in contention but it’s going to be a tall order. At least Brian O’Driscoll is back for the Blues – and that’s like having God back on your side. Or BOD as they like to call him! SOCCER: Lionel Messi was rightly awarded the world player of the year award on Monday, the Ballon D’Or, with both Ireland boss Giovanni Trapattoni and captain Robbie Keane voting for him. Little surprise then that Trap has always wished for an Irish Messi to come along. Alas, we may have a wait on our hands. SHAY Given reminded us why we have missed him with a brilliant performance for Aston Villa in their FA Cup win over Mick McCarthy’s Ipswich on Saturday. Some have poured cold water on Shay’s interest in playing for Ireland again, but they clearly didn’t pay attention to Keiren Westwood’s performance in the 6-1 defeat at home to Germany. My bet now is that Shay plays against Sweden in March. THOSE who constantly berate Luiz Suarez for cheating – and I have been there myself – lapped up the ammunition supplied by his handball goal for Liverpool against Mansfield in the FA Cup on Sunday. But the biggest fools in all of this are those who lead our game in FIFA and continue to ignore the technology that can help eradicate refereeing mistakes. It has long been time for change.